Fossat, P., Bacqué-Cazenave, J., Delbecque, J. and Cattaert, D. (2015). 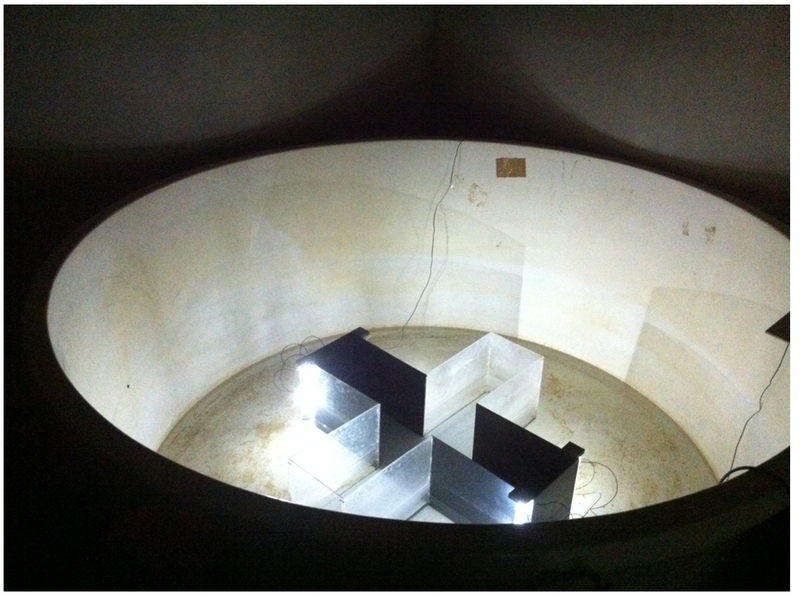 Measuring Anxiety-like Behavior in Crayfish by Using a Sub Aquatic Dark-light Plus Maze. Bio-protocol 5(3): e1396. DOI: 10.21769/BioProtoc.1396. Crayfish are omnivorous freshwater arthropods that naturally explore their environment during day and night, but also frequently hide under a shelter or in a hole in case of danger. They may be submitted to various stressors, including predation, social interactions or changes in environmental parameters (temperature, water quality, oxygen, etc.). It has been recently demonstrated that, as a consequence of stress, crayfish is able to adapt its exploratory behavior by restricting movements to protective areas, a response similar to the anxiety-like behavior (ALB) observed in rodents. To reveal such a behavior in an aquatic species, we designed a plus-shaped sub aquatic maze divided in two protective dark arms and two more aversive illuminated arms. The aim of this paradigm was to place crayfish in a conflicting situation between its innate curiosity for novel environment and its aversion for light (Leo, 2014; Pellow et al., 1985). Unstressed crayfish generally explore the whole maze, including illuminated arms. By contrast stressed crayfish remain preferentially in the dark arms (Fossat et al., 2014). Stressed crayfish injected with anxiolitics (chlordiazepoxide-CDZ), behave as unstressed animals. Several parameters, related to the light arms can be easily measured from video records by commercial software This protocol could be suitable for analyzing the effects of any stressful situation on ALB in crayfish, as well as in many other aquatic species. The study has been performed on adult male crayfish, Procambarus clarkii , fished near Bordeaux (France) in the "Réserve naturelle de Bruges" and stored in an animal house with 12:12 dark light cycle. Crayfish were fed ad libitum with pellets (Novo Prawn). Crayfish used for this study were 8.7 ± 0.8 cm and 22.1 ± 1.1 g. We generally used male crayfish in our experiments (distinguished by their first abdominal appendages), but this protocol is also suitable for experiments on females. Before any experiment, crayfish were isolated in enriched aquariums (75 cm x 40 cm x 50 cm), filled with recycled oxygenated water and enriched with pebbles and plastic tubes (behind or inside which they can hide). Animals were kept isolated at least 3 weeks before any experiment in order to erase past life histories and to avoid social interactions. Water must be chlorine free (agitating fresh tap water during 24 h is generally enough to remove chlorine). Change water after each session or use a conventional filtering system for aquarium. Fishnets are used to manipulate crayfish. Customized apparatus (65 x 65 cm, see Figure 1) is adapted to the size of adult crayfish. Smaller or larger dimensions might be necessary for young crayfish or other species. The illuminated arms were made of transparent Plexiglas and dark arms of opaque Plexiglas (Figure 1). The maze is filled with ca. 7 cm of oxygenated freshwater. 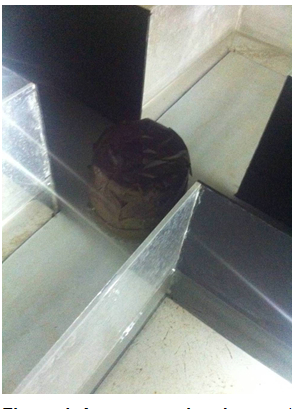 It is placed in the center of a larger round tank (Figure 2). The round tank (1.5 m in diameter) is also filled with 7 cm freshwater to equilibrate water pressure on each maze wall and to allow for good oxygenation and recycling of water (Figure 2). Figure 1. Dark/light plus maze. The total length of the maze is 65 cm x 65 cm. Each arm is 25 cm long and 15 cm wide. The middle zone is 15 cm x 15 cm. The light is generated by four sources comprising two LEDs. Each source of light is placed on the outside face of the opaque Plexiglas. Figure 2. The dark/light plus maze is placed in a larger tank (diameter 1.5 m). Right: Room light switch on. Left: Room light switch off under experimental conditions. Illumination of the light arms is performed by a series of LEDs (white light; voltage; 3.5 V, light intensity; 880 to 2,530 mcd) disposed outside the plus maze, on the outward side of the dark arms on the outmost extremities (see Figure 3). Figure 3. Two LEDs placed at the end of the dark arm illuminate a light arm. The height of the maze wall is 20 cm. A video camera must be placed above the maze. We used a handycam (Sony inc, model: HDR-XR155) but any commercial camera can be used. A pump (NewJet) is placed on a large tank between experimental sessions to agitate and oxygenate water. Light intensity was assessed with a luxmeter (Chauvin Arnoux). We used Ethovision v8 (Noldus) but any tracking software can be used. Measured parameters are listed in Table 1. Distance moved in the entire arena. Because our maze has been developed to measure the consequences of stress, crayfish must be submitted to some stressful situation before being tested in the dark/light plus maze. Any source of stress can be considered, either from natural or experimental origin. Previous data were obtained with electric fields applied to individual crayfish (Fossat et al., 2014), but we have verified that this protocol is also suitable for analyzing the consequences of social interactions (Fossat et al., to be published). Three groups of animals should be considered: unstressed or control animals, stressed animals (including stressed animals injected with saline) and stressed animals injected with the anxiolytic drug CDZ. Before experiment, the pump allowing water oxygenation is switched off and the white LED are switched on, while room light is switched off. The white LED intensity is adjusted to generate approximately a 50-lux intensity in the light arms and a 10-lux intensity in the dark arms. Each crayfish is carefully fished with a fishnet and placed in an opaque tank placed in the middle of the plus maze (see Figure 4). The video camera is switched on. A drawing board is filmed during a few seconds to record experiment data (date, reference number of animal). After at least 1 min, crayfish is released by carefully removing the opaque tank (pierced with small holes to prevent water backwash). Crayfish is allowed to freely visit the entire maze for a period of 10 min. After 10 min, video camera is switched off. Crayfish is carefully removed from the maze and replaced in its aquarium. The pump is activated to agitate the freshwater of the maze in all arms for 30 sec. Another crayfish can be tested. At the end of the experiment, the freshwater is removed from the maze, which is refilled with new freshwater and the pump is activated for oxygenation. Movies (see Videos 1 to 3) are then analyzed with Ethovision or other tracking software. It is recommended to particularly measure the total distance moved, the time spent in each arm, the number of entries, the latency for the first entry, the mean duration in each arm. Crayfish often stops moving before entering light arms and then enter or retreat. It is thus possible to estimate a retreat ratio calculated as the number of retreat divided by the total number of attempts. Figure 5. 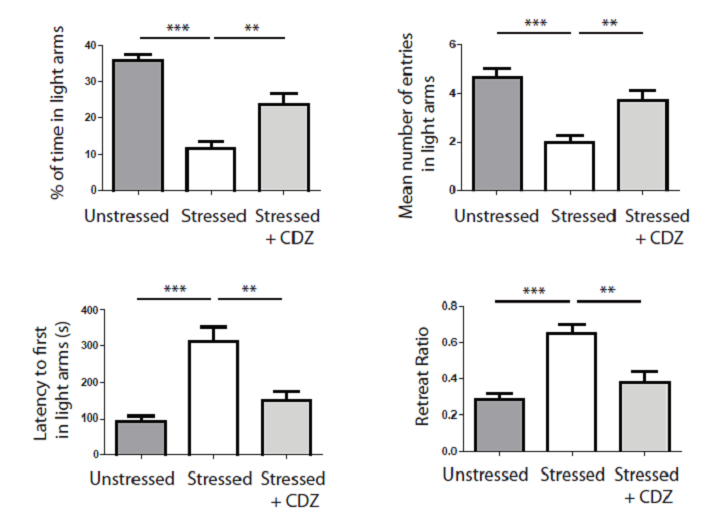 Typical routes of unstressed, stressed and stressed crayfish injected with CDZ. In unstressed, crayfish explore the whole maze (left panel). After a stressful situation, crayfish almost explores the dark arms (center panel). Stressed crayfish injected with CDZ, moved again towards the four arms. Figure 6. Stress induces a significant light aversion as shown by the decrease of time spent in light arms, the decrease of the mean number of entries in light, the increase of the latency to first entry in light arms and the increase of the retreat ratio (white histograms). Injection of an anxiolytic molecule (i.e., CDZ) significantly abolishes the aversion for light (soft grey histrograms). *** p<0,001, ** p<0,01, one way ANOVA. Be sure that freshwater is well oxygenated and use the pump whenever possible. Stop the pump during experiment. Between two maze measurements, be sure to correctly agitate water. When manipulating crayfish, be careful to limit stress. For example, do not test immediately animal that generates repetitive tail flips when fished. To avoid interference with daily rhythm of the crayfish, perform tests at the same time slot for all the experiments. Behavior can be biased if tested at different time slots. When removing the opaque chamber, be careful because crayfish can escape by tail flipping. At this point, you can reposition crayfish at the center of the maze and make a mark to note what happened or rather remove the animal and place another one in the maze. In order to avoid habituation, it seems preferable to test each animal only once. This means that series of control individuals are to be compared to series stressed animals, rather than comparing the behavior of each individual before and after stress. This work was supported by CNRS and “Conseil Régional d’Aquitaine” (2010301037). This protocol is adapted from Fossat et al. (2014). Leo, L. M. and Pamplona, F. A. (2014). Elevated plus maze test to assess anxiety-like behavior in the mouse. Bio-protocol 4(16): e1211. Pellow, S., Chopin, P., File, S. E. and Briley, M. (1985). 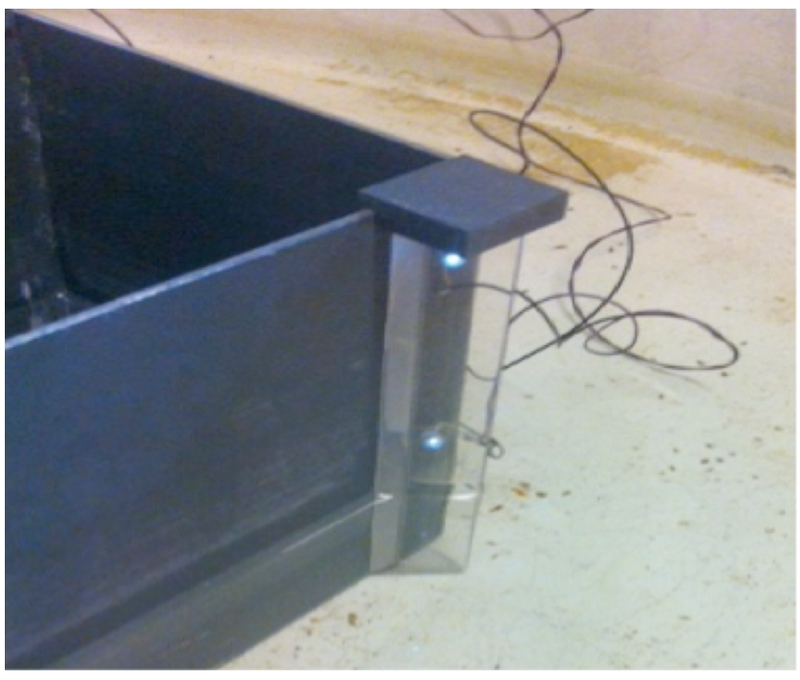 Validation of open:closed arm entries in an elevated plus-maze as a measure of anxiety in the rat. J Neurosci Methods 14(3): 149-167. How to cite: Fossat, P., Bacqué-Cazenave, J., Delbecque, J. and Cattaert, D. (2015). 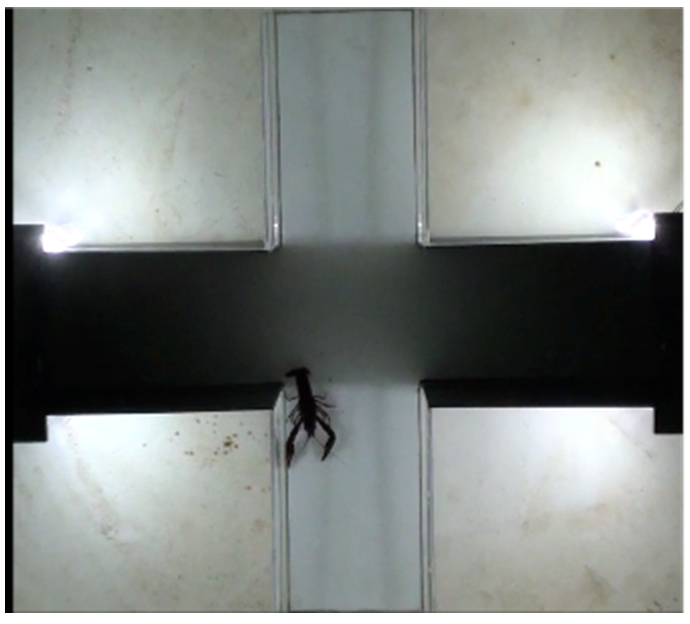 Measuring Anxiety-like Behavior in Crayfish by Using a Sub Aquatic Dark-light Plus Maze. Bio-protocol 5(3): e1396. DOI: 10.21769/BioProtoc.1396.